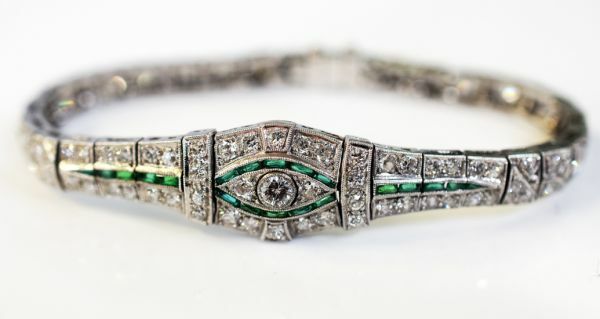 A beautiful Art Deco platinum mill grain bracelet featuring 1 round brilliant cut diamond, est. 0.18ct (VS2 clarity & H-I colour); 76 French and old European cut diamonds, est. 2.35ct (VS-SI clarity & F-G colour); 15 old European cut diamonds, est. 1.70ct (VS-SI1 clarity & G-H colour) and 30 caliber cut synthetic deep bluish green to deep yellowish green emeralds, est. 0.66ct. The use of synthetic gemstones was typical of that Era. It has a concealed safety clasp and is approx. 6 7/8 inches (17.46cm) in length. 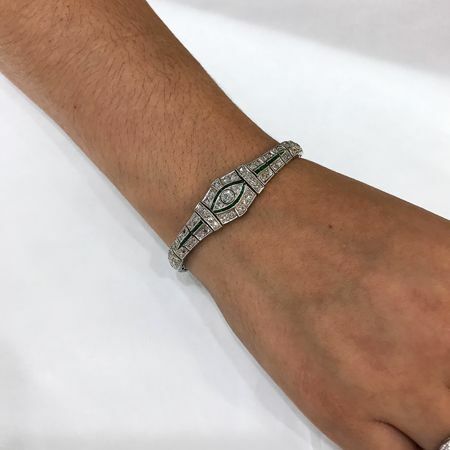 Please make an appointment to see this beautiful bracelet.